Meadow Feeds recently launched iFeed, a technically focused approach to farm service and management which encompasses various value added services. An integral part of iFeed is Bin Monitoring. 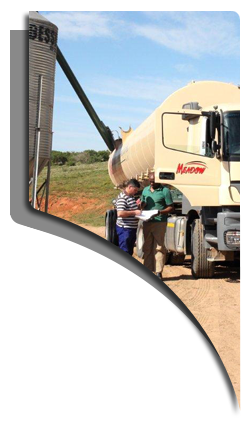 As a market leader in the Southern African animal feed industry, Meadow Feeds has introduced Bin Monitoring in order to improve both on-farm and delivery efficiencies utilising the Meadow Feeds fleet. Bin Monitoring allows both the client and the feed supplier to accurately monitor and manage feed stock levels and utilise the feed stored in bulk feed silo’s fitted with load cells. The device uses directcontact sensing technology for continuous bin mass measurement. Once installed, this system connects to an internet database, which in turn monitors and captures information on any addition’s to and usage of the bin’s capacity. This allows for live data access at all times. The system provides regular updates of feed stock levels and transmits this data to the client and the feed supplier. This data can then be used to present in the desired format, either as graphs, flow charts or other graphics. Presented in this form, the daily data is easy to understand and interpret. One quick glance at the graphics allows the client and Meadow Feeds to assess the rate of feed usage and plan accordingly. Bin Monitoring gives clients peace of mind, allowing for greater control over and monitoring of feed which is by far the highest on-farm cost. It reduces the risk of running out of feed and allows Meadow Feeds to accurately monitor feed usage, ensuring timeous processing of orders and efficient feed delivery. Bin Monitoring also allows for improved fleet management and truck payloads, reducing the risk of feed returns and delivering feed into the incorrect bin. Improved feed stock management means fewer deliveries, resulting in a better carbon footprint for Meadow Feeds and its clients. An added bonus is that it allows for efficient afterhours delivery, as Bin Monitoring gives the client proof of delivery and an accurate measure of the quantity delivered. Consequently, the risk of feed theft is largely eliminated. • the type of products used. Future developments will allow for feed conversion efficiency calculations, temperature and CO2 monitoring. Other technological services will also be linked to the Bin Monitoring data, allowing a holistic approach to technical advice and management at farm level. Bin Monitoring, together with the other components of Meadow’s iFeed programme, allows clients to improve on-farm efficiencies and have the best possible control over these vital aspects of their business.